Are you looking for a soy wax that has excellent scent throw hot and cold made from 100% hydrogenated soybean oil? Then Ez Soy may be just what you are looking for! Made from high quality, certified Kosher 100% soybean oils that are non-toxic, biodegradable & environmentally safe, Ez Soy is an excellent alternative to traditional paraffin waxes. EZ Soy works great with most fragrance and essential oils, requires no repours and has excellent adhesion to glass. EZ Soy wax comes in flake form and can even be melted in the microwave! Perfect for first time candle makers or larger production candle companies! Some degree of bloom or frost can occur with any soy wax, testing of fragrances and dyes as well as pouring temps can in some cases decrease or eliminate this. EZ Soy is manufactured in the USA from soybeans grown right here in America! Soy waxes produce little to no black soot when made and burned properly. EZ Soy will hold up to a 10% fragrance load however we have had the best hot scent throw results using 6%. EZ Soy Melt Point: 125�F Container Candle Soy Wax. This wax is suitable for making wax melts and votive candles following the instructions below. EZ Soy can NOT be used to make free standing pillar or molded candles. Heat EZ Soy to 175-180*. Add your dye and blend well, then add your fragrance and blend well. Allow the wax to cool to about 105� and start stirring. When the wax reaches a slushy stage, it looks similar to an Icee starting to warm up, pour the wax into room temperature jars. The actual pour temp of the wax is about 95� but because it is not completely fluid at this point, an internal temp is hard to achieve. Pouring hotter will result in more frosting and tops that are not completely smooth. A starting point for testing is a CD 12 works well with most scents in an 8 oz jelly jar candle. Most any non metal core wick series will work well in soy. We suggest sample packs of wicks for testing to find what works best for you! Zinc core wicks are not recommended for use in soy wax. EZ Soy can also be used for votive candle. To use as a votive be sure to add mold release to the wax or use mold release in the molds when using metal molds. Add about 5 TBSP per lb of wax Stearic Acid to harden the wax for tarts and votives. always used this, always get good feedback from customers. melts down awesome, no smoke. I've used EzSoy for 5 yrs & really really LOVE it! Really like this wax!! Easy to work with and burns clean! my favorite soy wax i've used. Sticking with this one. The very best soy wax ever! I always have and will always use this for my soy container candles! I so love this wax and so do my customers!!! LOVE this one! THE BEST soy wax on the market! This wax is one of the main reasons why I love Bitter Creek. Absolutely wonderful products. You just can't go wrong with this soy wax that is only available at Bitter Creek! Really easy to work with, melts easily right in the microwave, just all around the perfect wax. A friend told me about the EZ Soy and how I just "had to have it". I'm really glad I did. My hobby became a full time business for me strictly because of this wax. I can't say enough great things about this soy wax. It's fantastic! I just recently came across Bitter Creek online and am surprised I never found them before. 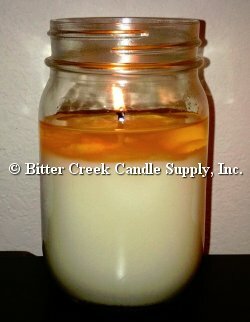 I've tried soy wax from pretty much every other supplier out there, but none of the soy waxes came close to the quality of Bitter Creek's EzSoy. This wax is really something. All of my customers just rave about my soy candles. I am just so happy with this product!! !